With the introduction of the R7 and R9 series Radeon cards, AMD has been making a concerted effort to reclaim the attention of the enthusiast market. Given the dominance Nvidia has had with the Geforce GT 600 series, AMD’s got their work cut out for them. As part of their effort to beat Nvidia in the performance-per-dollar game, they’ve released several new cards across a wide range of price points. 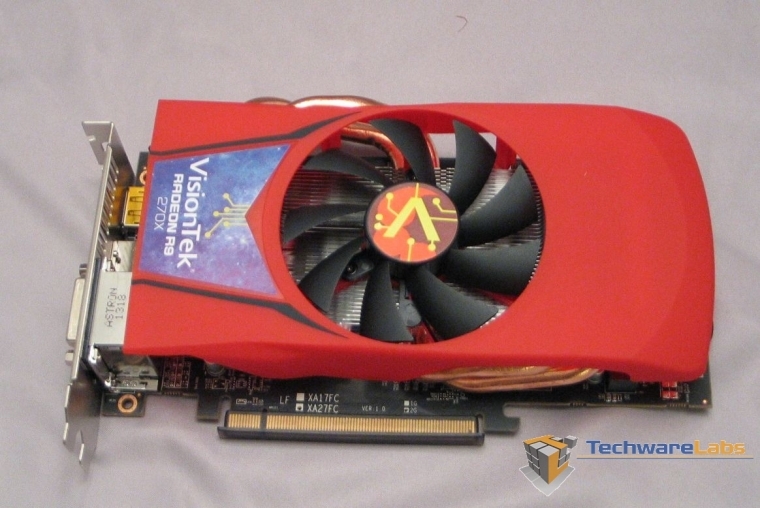 The VisionTek R9 270X, aimed at the $200 price range, is meant to cater to the gamer on a budget. 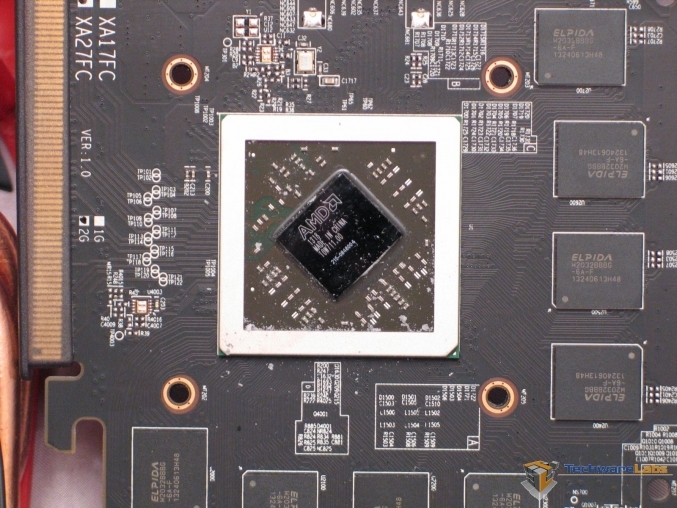 Let’s dive in and see just what AMD and VisionTek have given us, and how it performs. The front of the box is serviceable but uninspired. We get the model number, the amount of memory, and that’s pretty much it. Not awful, but a picture of the card or a window would have been nice. 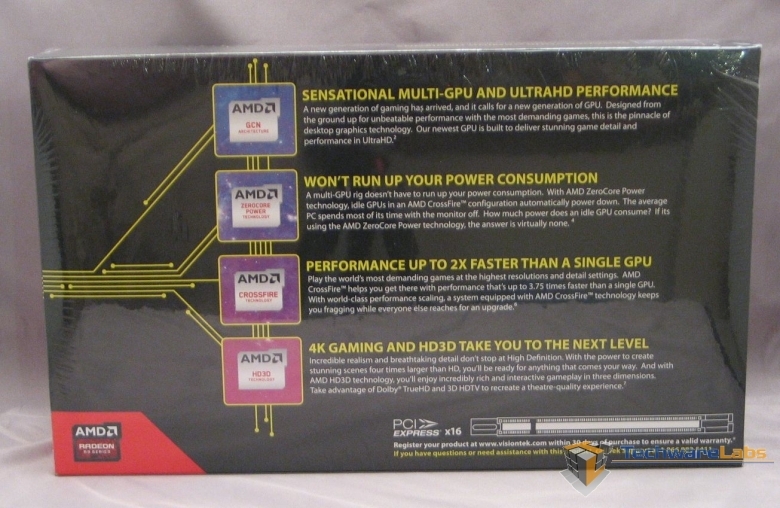 The back is taken up with marketing blurbs copy-pasta’d from AMD’s website—and old copy-pasta at that, for three of the four bullet points. Not terribly surprising, given that the R9 270X is basically a HD 7870 GHz with a slight clock bump, but still, they could have tried a little harder. The new trend towards using cardboard in place of foam for packaging materials continues. This isn’t a bad thing when done right, but I see no efforts at reinforcing the cardboard here. Not necessarily a bad thing, but it hardly inspires confidence. 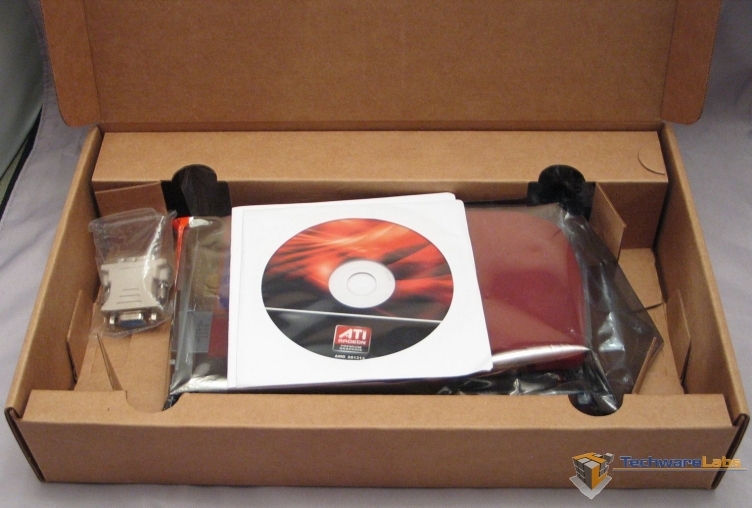 At the end of the day though this card is marketed towards enthusiasts and overclockers and we usually don’t need or open the box again after installation. We prefer the plain design and thus cheaper price. Here’s what you get for accessories: driver disk, a bare-bones quick install pamphlet, two power dongles for converting from Molex 4-pin to PCIe 6-pin, and a DVI->VGA dongle. No Crossfire bridge, which is a bit unfortunate, and no bundled games. 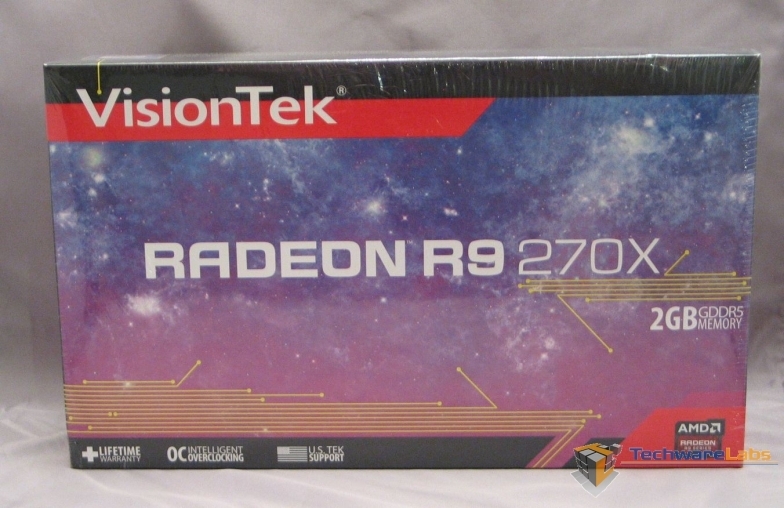 VisionTek decided not to use the stock cooler for this card; a laudable enough decision given the unpleasant noise levels the AMD reference cooler makes. Much of what’s interesting about the cooler is hidden by the plastic shroud though, so let’s take it off and have a look. Unscrewing the cooler from its mount points on the card, a few more details become evident. In an attempt to improve cooling, VisionTek used a 2-pipe heatpipe solution to increase the total effective surface area of the cooler. Getting the cooler back on was a simple task, given the use of captive-spring screws to provide even tension across the mating surface of the card. The design of the heatsink proved to be very effective in our tests and kept the temperatures well within bounds. This is an excellent addition to the 270X by VisionTek and clearly demonstrates their desire to appeal to the overclocking and enthusiasts crowd. 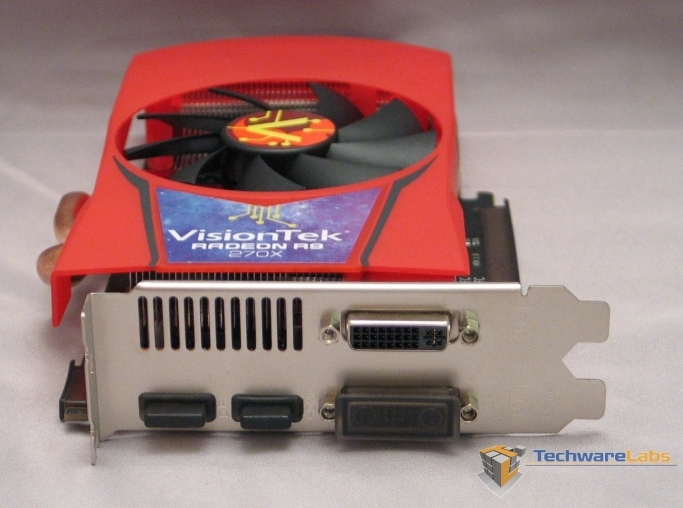 Given the combo of price and performance where heat is the enemy VisionTek should be applauded for their implementation of the 270X design here. 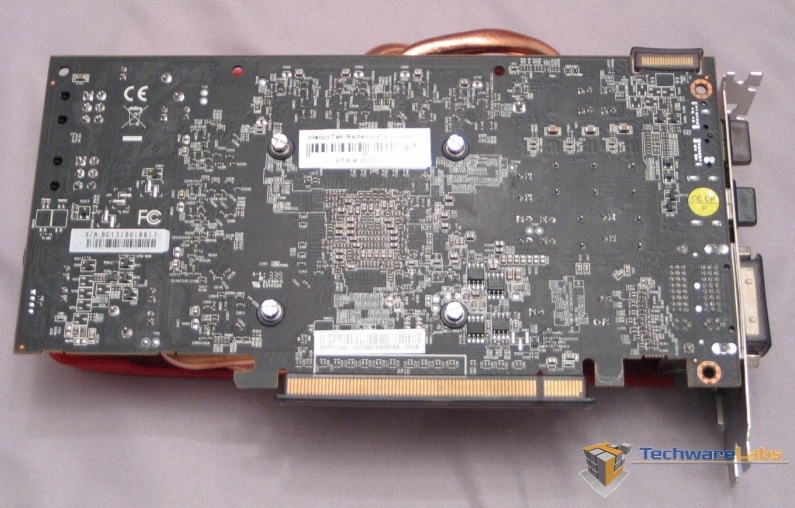 Zooming in on the GPU, we can see that yes, this is a R9 270X, and that it’s being supported by eight 256MB ram chips. As with many of their GPUs, AMD has elected not to put a heat spreader on this one, which means that the 2-pipe heatpipe solution is about the best we can hope for. Moving down toward the rear of the card, we can see that it feeds on two 6-pin PCIe power plugs, which puts a cap on max power draw at 225W. The plugs are on the end rather than the top, which might present clearance challenges in an especially tight chassis. Any normal mid-tower ATX case will have clearance for this card with inches to spare, however. The shroud hangs over the rear edge of the card by a few millimeters, though the tapered edge helps to keep it from feeling bulky. Moving up to the header, we can see the outputs this card provides: 2 dual-link DVI, 1 HDMI and 1 DisplayPort. If you want to drive three displays from this card for whatever purpose, one of them must be driven by the DisplayPort output. 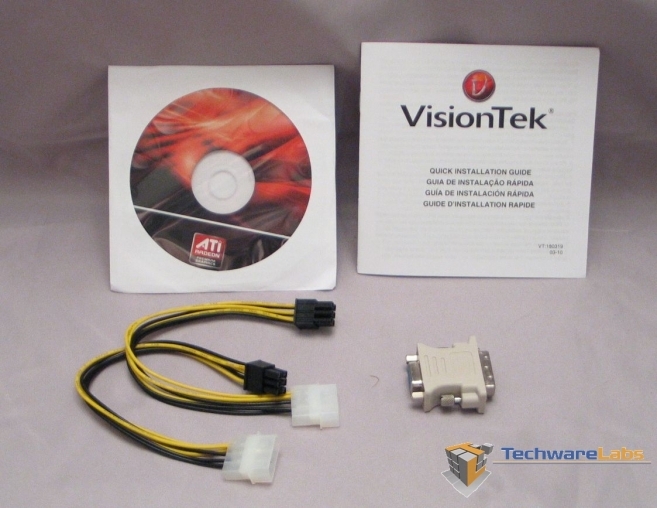 Nothing unusual here, except perhaps the plastic caps VisionTek has provided for the PCIe connector and the Crossfire bridge connector.